Garrow prosecuted General Thomas Picton, who, while serving as the first British governor of Trinidad, ordered that a young free person of color, Louisa Calderon, be tortured to get her to confess a crime. 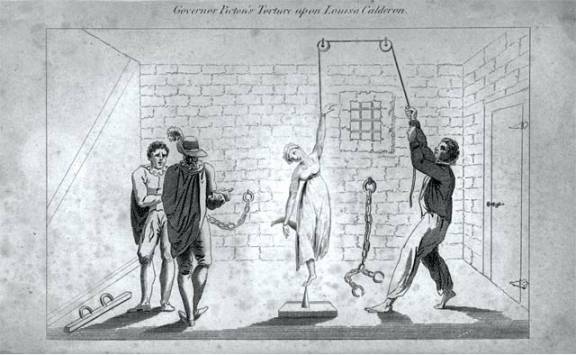 Being brought home to face a series of related charges, Picton was eventually tried on the single count of using torture on Louisa Calderon. The trial commenced on February 24, 1806 in the court of King’s Bench. Garrow was prosecutor. It was a much followed event in London. And it was this trial that was featured in the next to last episode of the BBC1 historic drama “Garrow’s Law” (originally aired 27 November 2011). The trial is also featured as Chapter 7 of our biography: “Sir William Garrow, His Life, Times and Fight for Justice.” The trial is one of the highly remembered cases in Garrow’s career. Drawing used by William Garrow in prosecuting General Picton, from the article by James Epstein, “Politics of Colonial Sensation: The Trial of Thomas Picton and the Cause of Louisa Calderon”.A penetrating analysis of the Picton trial has been written by James Epstein in his American Historical Review Forum paper: “Politics of Colonial Sensation: The Trial of Thomas Picton and the Cause of Louisa Calderon.” I urge those interested in understanding the significance of this trial in English history to read this paper – now available online. Epstein puts the trial into the context of the times in England. The trial brought public notice to the “disjunction between a national self-image of humane governance and the realities of colonial rule” in that it showed the day-to-day violence of empire, in sharp contract to the ideas of an English way of life at home. The trial brought into focus the conflicts between British abolitionists and the British merchants and those who owned plantations where the economics of these businesses were based on slavery. And the trial exposed this struggle to the more typical citizens in the English homeland who lived isolated from slavery in the colonies. Concerning the trial, Epstein provides interesting details, such as Garrow’s use of a watercolor to elicit from Louisa Calderon the emotional reaction of remembering her torture, in plain view of the eyes of the jury. You can see Garrow in action, in the middle of this public event. Epstein spends considerable space depicting what was happening outside the courtroom in response to the trial. This includes the public reaction by the critics as well as the supporters of Picton leading up to the trial and following the proceedings. The term “Politics of Colonial Sensation” in the title of Epstein’s paper, concerns his study of how intense feelings on issues were a part of the culture of the times…a Gothic mode of responding to events. It shows how this moment in culture, which focused on fantastic tales dealing with horror, despair, the grotesque and other dark subjects, played into the events of the trial. Epstein also introduces earlier work related to the Picton trial. V.S. Naipaul, a son of Trinidad by birth and a celebrated author, wrote two books of interest. In A Way in the World (1994) through a fictional account, Naipaul introduces the Picton trial in Trinidad history. In a much earlier work, The Loss of El Dorado: A History (1969) Naipaul presents a penetrating history of the Picton years in Trinidad, with a hard focus on the torture of Louisa Calderon and the conditions surrounding that event. Both help put Garrow’s efforts in the Picton trial into sharp historical focus. The purpose of this piece is to introduce Epstein’s important work on the Picton trial to those interested in how William Garrow functioned in this trial and how the trial can be viewed in the context of the times. The document can be retrieved by clicking on the following code.